An unusually bright gamma-ray burst produced a jet that emerged at nearly the speed of light. On April 27, several satellites — including NASA's Swift satellite and Fermi Gamma-ray Space Telescope — observed an unusually bright burst of gamma radiation. The explosion unleashed an energetic jet of particles that traveled at nearly the speed of light, researchers said. A gamma-ray burst that exploded in April 2013 is the most luminous object in the field, as seen in this image from NASA's Swift satellite. All the other objects seen in the image are stars from our own galaxy, while the gamma-ray burst is millions of times farther away. This section shows an area of the sky about a quarter the size of the full moon. 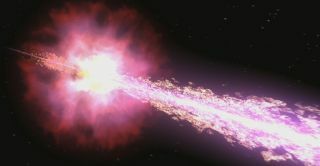 The gamma-ray burst was described in a series of studies published online today (Nov. 21) in the journal Science. "We normally detect GRBs at great distance, meaning they usually appear quite faint," study co-author Paul O'Brien, an astronomer at the University of Leicester in the United Kingdom, said in a statement. "In this case, the burst happened only a quarter of the way across the universe — meaning it was very bright. On this occasion, a powerful supernova was also produced — something we have not recorded before alongside a powerful GRB — and we will now be seeking to understand this occurrence." Close-up image of the brightest gamma-ray burst ever seen, taken in April 2013 by the ultraviolet/optical telescope on NASA's Swift satellite.